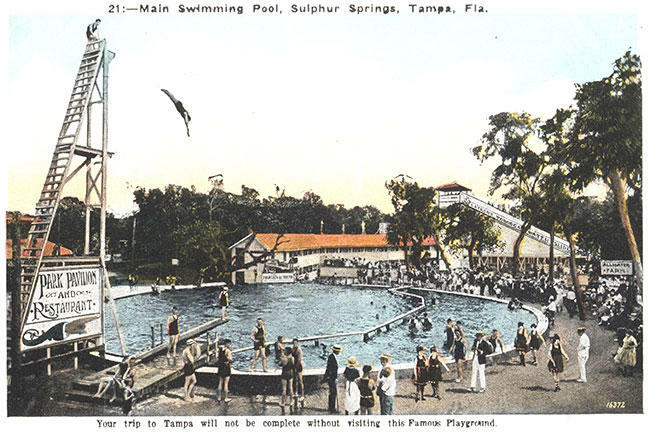 A postcard from the "Sulphur Springs: An Enduring Legacy" display shows visitors diving into the Sulphur Springs pool in the 1920s. "At least we feel, a lot of times, communities are forgotten in this hustle and bustle," Norma Robinson, director of the Sulphur Springs Museum and Heritage Center, said. "And when you have a community, one like Sulphur Springs, if it’s forgotten, then you don’t know how to move forward." 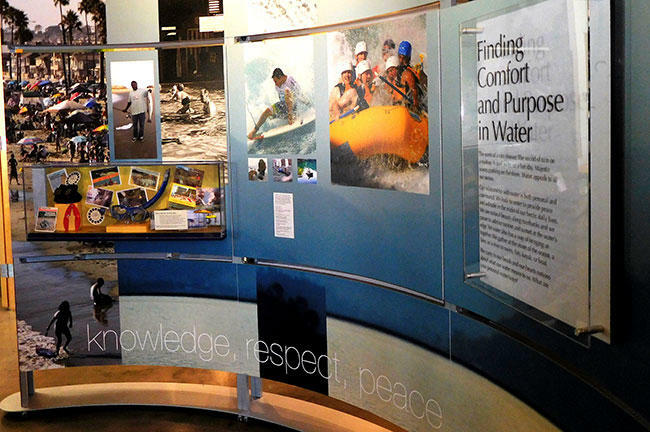 The museum formally opened in its new location along the Hillsborough River this month. 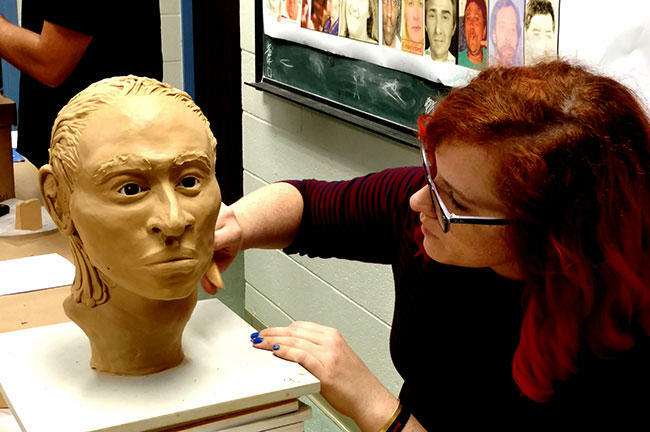 Right now, there’s three exhibitions – two permanent displays that were curated by students from the University of South Florida Department of Anthropology and a temporary one that comes from one of the most prestigious names in the museum world: the Smithsonian. PhD candidate Vivian Gornik and Masters student Preston LeFarge created a history of Mann-Wagnon Park, where the museum now resides. And Gornik also curated Sulphur Springs: An Enduring Legacy, an exhibit on the early, heady days of Sulphur Springs. 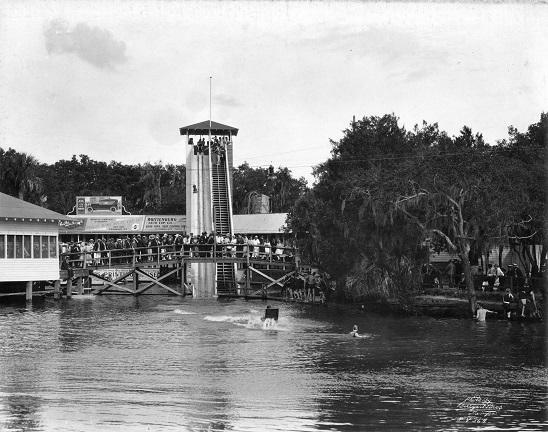 She says that in the late 1800s and early 1900s, before Walt Disney World, Sulphur Springs was one of Florida’s premier tourist destinations. A picture in the collection shows visitors sliding down the toboggan slide into Sulphur Spring. "Growing up in Orlando, tourism and Florida were synonymous for me, but I had no idea that one of the first destinations in Florida was Sulphur Springs," Gornik said. "It was kind of surprising for me to learn that it started out as kind of this humble swimming hole where the water supposedly had these healing properties and then a developer came in, kind of recognized the potential of it and developed it into this bigger destination. They had toboggan slides and of course an alligator farm, which is sort of typical Florida, right?" Gornik adds that their work doesn’t whitewash Sulphur Springs’ history, acknowledging that, like much of the South, it was segregated. "So while we talk about sort of the heyday of Sulphur Springs and that it was the Roaring 20s and it was this awesome tourist destination, we also wanted to acknowledge that it wasn’t necessarily the case for everyone and that it wasn’t accessible for everyone," she said. 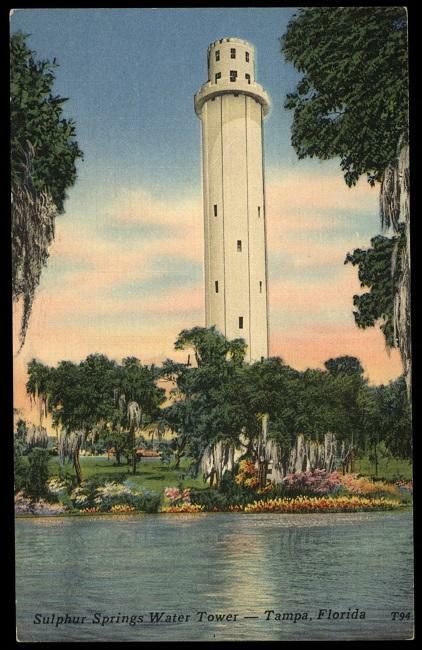 A postcard from the exhibition shows the Sulphur Springs water tower, which still sits just west of I-275. "A lot of things get highlighted, like Gasparilla and Ybor, they tend to get a lot of the attention," Gornik added. "But I think Sulphur Springs and places like Temple Terrace, these smaller neighborhoods, they’re just as important, I think, in the history of Tampa." Visitors will learn about a 1933 dam break that flooded much of Sulphur Springs. It, followed by the Great Depression and World War II, turned the neighborhood into the poor, blighted area it is today. One of the final, biggest blows to the area came when the spring was closed in 1986. Pollution from storm water and street runoff flowed into a number of nearby sinkholes. It remains closed today. "It was a place to swim and entertainment for families, but once it became polluted, then it was closed," Robinson said. "So we want to talk about the importance of the ecosystem and importance of water." That topic is covered in the museum’s third exhibition, Water/Ways. 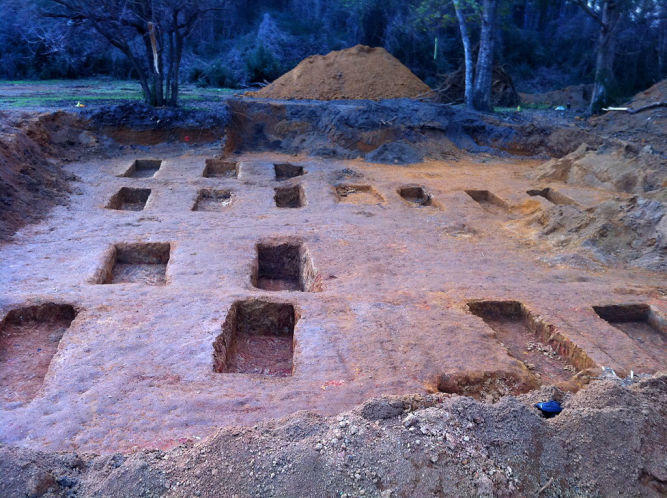 "Communities grow up around water, they have done ever since prehistoric times," USF Anthropology Professor Elizabeth Bird said. "(Water/Ways is) basically about water in all its aspects – environmental, cultural, historical, spiritual." The interactive display is on loan from the Smithsonian for six weeks. It’s part of the institution’s Museum on Main Street program, which offers smaller museums access to high-quality presentations that people would normally have to travel to bigger cities to see. "It shows, I think, people in any community, that heritage, history, natural history, the environment, is theirs," Bird said. "It doesn’t just belong to people in Washington, it doesn’t just belong to the rich, it belongs to everybody." "Water/Ways," a Smithsonian exhibit on display at the Sulphur Springs Musuem through March 18 as part of the Institution's Museum on Main Street program. Sulphur Springs is one of six Florida communities, and the only Bay area one, chosen to display the Smithsonian exhibit. Being chosen for such an honor is not lost on Gornik. "I have a Masters in museum studies, so I’m a museum nerd to begin with, and the Smithsonian, of course, is kind of a mecca for all of us, so actually, yeah, it’s really exciting to have some of my work hanging up next to the Smithsonian," she said. Bird said the students' work shows how her school focuses on applied anthropology. "Rather than just do the research and stash it away in academic journals or in archives, we want to bring it out to the public," she said. And she acknowledges that working with a local museum, particularly one so close to USF, is a win-win for both sides. "In a sense, it's a living laboratory for our students to come out and learn about community, to learn about organizations, about history, about the dynamics of a particular neighborhood, which is all part of what anthropology is about," Bird added. "At the same time, what we can do is produce things and projects that are of value to the community." Robinson and her husband Joseph, along with Linda Hope, created the museum shortly after the Robinsons retired to the neighborhood from New York in 2002. Right now, the operation is entirely funded by private donations. School groups are scheduled to visit the Water/Ways exhibition, and Norma Robinson hopes the museum isn't far from the day where they'll have both the technology and the relationships that would allow students to see similar displays remotely from museums around the world. "They may never be able to visit the Smithsonian, Afro-American Smithsonian Museum, even museums in Europe, but they will be able to see them here," she said. "We want them to be aware of how important history is." History, she adds, that begins where they live. "We want them to be proud of the community in which they live and also to help take care of the heritage and to help it grow," Robinson said. Water/Ways runs through March 18. The Sulphur Springs Museum and Heritage Center, located at 1101 E. River Cove Street in Tampa, is open from noon to 4 p.m. Wednesday through Sunday. 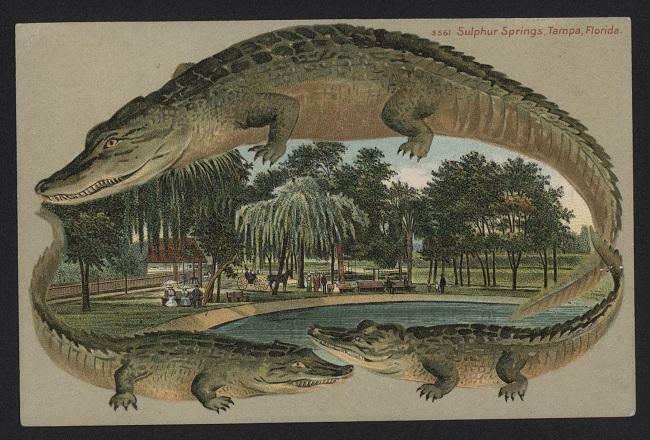 A Sulphur Springs postcard from the collection. Mann Wagnon Memorial Park is a peaceful hideaway in the middle of the bustling city of Tampa off Nebraska Avenue. It's where the Museum of Science and Industry got its start as the Museum of Natural History back in the '60s before becoming the MOSI on Fowler Avenue that it is now. UPDATE 9 a.m. 1/27: Andy Huse will give an encore presentation of "Tampa's Rebels and Revolutionaries: Looking Beyond the Pirates and Gangsters" Tuesday, January 28, at noon in the USF Tampa Library's Grace Allen Room. ORIGINAL POST 3:45 p.m. 1/22: If you hear the phrase "Tampa outlaw" and think of the pirate José Gaspar or the gangsters Santo Trafficante, Sr., and his son, Santo Jr., Andy Huse would like you to think again. The USF Special Collections librarian says that there's been other far more colorful renegades in Tampa's past that people don't know a lot about - and he'll talk about them Thursday night when he presents "Tampa's Rebels and Revolutionaries: Looking Beyond the Pirates and Gangsters" at the Florida Museum of Photographic Arts in downtown Tampa. USF Special Collections librarian/historian Andy Huse's extended interview with WUSF's Mark Schreiner.